Murray is a supervisor for a security company. He often works crazy hours of the day. Some days he works all morning and afternoon while other days he could be working all hours of the night. Murray sometimes finds he never has time to exercise or just relax. It wasn’t until one day Murray went for his routine checkup and his doctor explained to him, “since he was getting older he had to find time to exercise”. He told Murray, not only exercise is good for the body, but also the brain as well. He explained to Murray that one exercise is excellent for the body and the brain is swimming”. He described how swimming helps blood flow, which could help improve memory, mood, clarity, and focus. 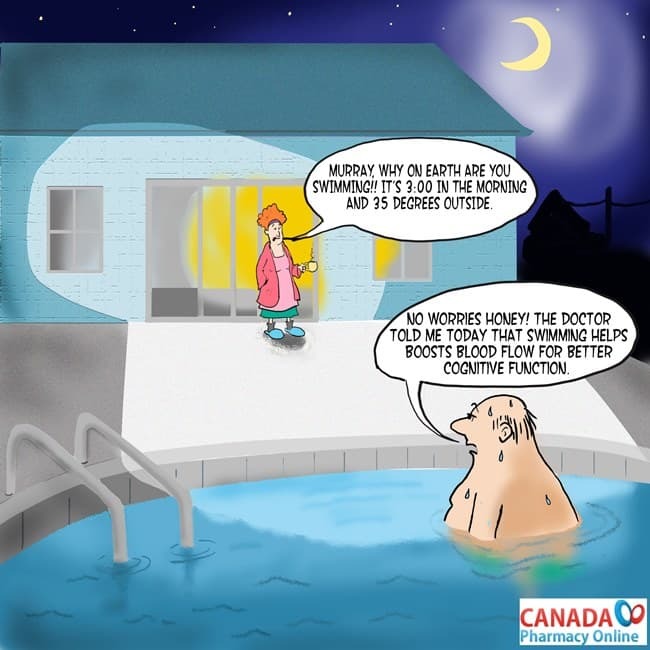 Murray was so happy because now he had a reason to use his grand pool that he never uses, only when his children and grandchildren come over to visit. Since Murray works such odd hours during the day, one night after returning from work, he thought of taking a swim in his pool. He thought of the doctor and what he had mentioned about how good swimming was for the health. So Murray hurried to put his swimming trunks and dove straight into his pool. While swimming in the pool, Murray’s wife appeared. She said, “Murray, why on earth are you swimming? It’s 3:00 in the morning and 35 degrees outside!” Murray replied, “No worries honey! The doctor told me that swimming helps boosts blood flow for better cognitive function.” Murray’s wife just smiled and said: “Just make sure you close and lock all the doors honey, before coming to bed”.